Hamilton trainer Graeme Rogerson is excited to produce a bigger, stronger version of talented sprinter Gift Of Power at Awapuni on Saturday. The younger model of Gift Of Power was adept enough to win eight of her 14 starts as a two-and three-year-old up to Group Two level, so Rogerson has every reason to aim high with the extra-powered four-year-old mare. "She's a year older and a bigger, stronger mare now," said Rogerson, who trains the Power mare with his wife Debbie and granddaughter Bailey. "She's going very well. She trialled very well at Taupo and while she's better left-handed she had a quiet trial at Te Teko before that and pleased She'll run well this weekend. We're happy with her." In the hands of Bailey Rogerson, Gift Of Power kept up a strong clip to win the 5 1⁄2 f Taupo open trial by three-quarters of a length, beating Group One winner Jon Snow, who then went on to finish fourth in last week's Gr.1 Tarzino Trophy (1400m) at Hastings. 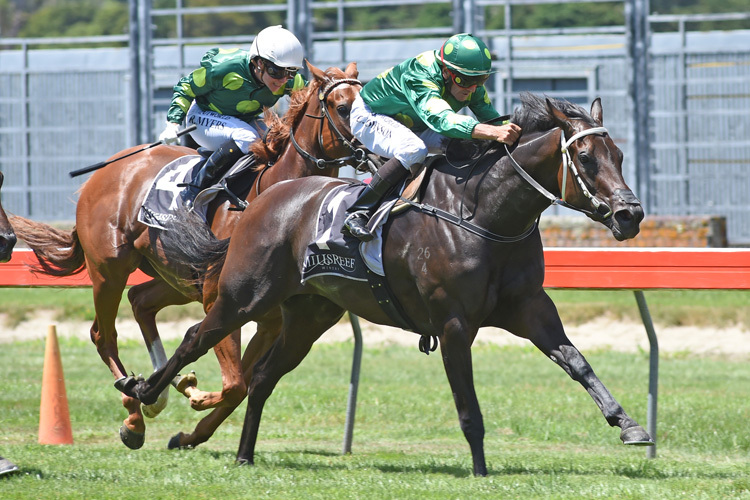 Gift Of Power has yet to be beaten first-up in a new campaign and she looks favoured as the likely leader in the six-horse Pilet Contracting/Pioneer Seeds Handicap (1200m) at Awapuni. "She should be very competitive," said Rogerson, who hasn't yet secured the framework of her spring and summer campaign. "We'll just play it by ear what she does from here. It would be nice to get a Group One win with her and she's unbeaten at Trentham. "There wouldn't be many mares racing in New Zealand with a better pedigree. She was already a Group Two winner but Patrick (part-owner Sir Patrick Hogan) was keen to race her on another year." By Oasis Dream stallion Power, Gift Of Power hails from the Diamond Lover branch of the Eight Carat family, with racetrack stars such as Octagonal, Tristalove, Viscount and Mouawad gracing her pedigree page.